On this date in 2002, the historic Durango and Silverton narrow gauge railroad was forced to stop operating because of fears that cinders from the steam train would spark wildfires. 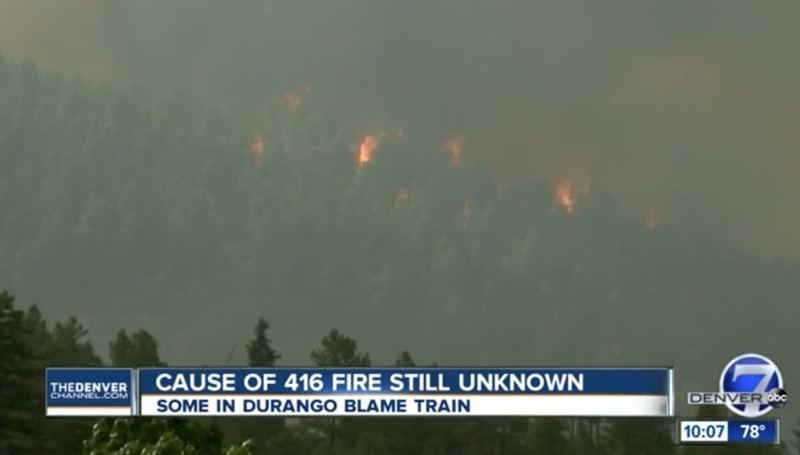 History is repeating itself right now in 2018 as the railroad is suspended again as the fight continues against the 416 fire which has been burning in the beautiful San Juan Mountains of southwestern Colorado. There are some residents who say that the current fire may have been caused by the hot cinders that the train emits. The official cause of the fire has not been determined yet, but the train’s owners have suspended its operation since June 1, when the fire started. The 416 fire has burned 34,161 acres and is only 35% contained as of this morning according to InciWeb. Authorities say it may not be contained until the summer monsoon pattern arrives. The railroad has furloughed 150 employees and the impact on the tourist town of Silverton, which depends heavily on retail from the train’s visitors, has been heavy. Sixteen years ago, the massive Missionary Ridge wildfire was already burning along the train’s route to Silverton. The wildfire was the second largest in Colorado history, burning nearly 75,000 acres before being extinguished in early July. A total of $40.8 million was spent on fighting the fire and 46 homes were destroyed. It would be three weeks before the train could resume operations, forcing it to lose $4.5 million that season. The State of Colorado issued an emergency $1 million loan to the railroad, which employees 200 people in the cities of Durango and Silverton and delivers a $100 million annual economic impact to the area. Meanwhile, the Cumbres and Toltec Scenic Railroad from Chama, NM to Antonito, CO was forced to suspend operations on June 7th as the result of an order from the U.S. Forest Service. It was restarted on June 28th, much to the relief of local businesses who are heavily dependent on the attraction for tourism dollars. Both railroads use extensive fire mitigation efforts, including a tank car in the train consists that spray water along the rails and out 12 feet on either side of the train. They do seasonal fuel removal and spark suppression technology on their smokestacks. There are also fire suppression teams that follow the trains. A helicopter has even been used by the D&S during peak fire season. A total of 6,400,000 acres burned due to wildfires in the United States in 2003, twice the average. It is shaping up to be a very busy fire season in the West according to the Interagency Fire Center, and this is following on the heels of what is believed to be the most expensive wildfire year: 2017 which cost $18 billion.